Over at FilmCritic.com this week, I follow on to the discussion here earlier this week on the subject of “Flying Snowmen,” and ask how the phenomenon extends to science fiction films in particular. That’s right! I’m recycling an idea I had here! And getting paid for it! God bless America, man. Aaaaaanyway, go over there and see what more I have to say on the subject, and feel free to leave your comments there. They love it when you do that. Seriously, it makes their day. I asked them. They told me. There you are. As I noted in the previous entry, today I (with artist Jeff Zugale) contributed a guest panel to the estimable Penny Arcade Web comic. The guys at Penny Arcade also run a charity called Child’s Play, which donates toy and games to children who endure hospital stays for treatment of their illnesses. I think this is a fantastic charity and I personally support it every year. 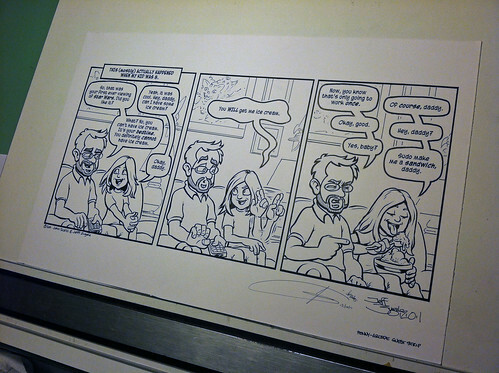 As a way of showing our appreciation to the Penny Arcade folks for giving us a guest spot, Jeff and I are now auctioning off the original artwork for the guest strip (pictured above) with all the proceeds of the auction to go to Child’s Play. This is literally a one-of-a-kind piece of work, as it is the original inked art which was scanned in for the strip, on Strathmore board, signed and dated by me and by Jeff Zugale. Jeff knows the exact dimensions, but given the standard Strathmore board dimensions, I suspect it’s 22 inches by 15 inches, tells me that the dimensions are 17 inches by 11 inches, which makes it nicely suitable for framing. Here’s a much larger picture of the original, so you can examine it in detail. Extra! If the bidding gets over $1,000, I will throw in some nifty extras to be determined later (but I promise they will be nifty and you will squee with delight, if you are the sort of person who indulges in the squeeing). 1. Bid here on the site. Bidding begins at $25. Each new bid must increase the former bid by at least $5, in dollar amounts. If two bids are made at the same level, the first bid offered is the official bid. You may not increase your bid until someone else bids higher. 3. However, if any point I am contacted privately by a bidder who wishes to jump the bidding to a significantly higher level (i.e., $250+ more than the current bid in the early stages, $1000+ more in later stages), if I am convinced it’s a serious bid, I’ll go into the thread and raise the bidding to that level. This is the only way to jump ahead. I won’t; you will. I will forward you the information you’ll need to make the donation to the Child’s Play charity. You will need to send the money within three business days or be disqualified. Send me a copy of the donation receipt and give me permission to verify the donation with Child’s Play. This way you’ll also get any applicable tax deductions. We will ship it/them to you, worldwide, without charge. When we ship it we will provide you with the tracking number so you will know where it is and when it’s going to get to you. The auction runs through Monday, December 19 at 5pm Eastern. Good luck and happy bidding! I thank you, Child’s Play thanks you, and I’m sure the kids in the hospitals who will get the toys and games would thank you too. 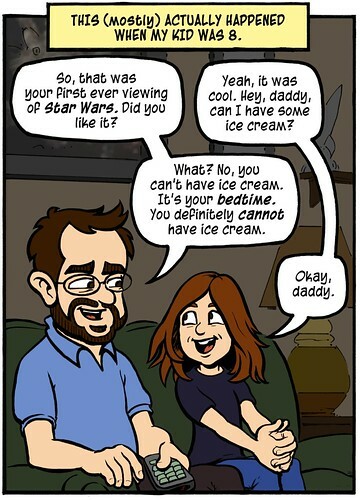 And it’s full of nerdy parental goodness, if I do say so myself. The full strip is here. I figure most people who are nerds who spend any time online will get the punchline, but if you don’t, this link will give you context. For those of you wondering if I drew the comic as well as having written it, allow me to say: AH HA HA HA HAH HA! No. The artist in this case is the estimable Jeff Zugale. Jeff, some of you may recall, has collaborated with me before: Here’s one thing he’s done for me; here’s another. I was delighted to be able to call on him for this. I’ll also note that if you enjoy Jeff’s web comic stylings, you’ll be able to see more of them soon; he’s got himself a ginchy new gig. Congratulations Jeff! Some of you may ask: How did I get this guest gig at Penny Arcade? Well, I’ve known and been friends with Jerry and Mike for a while now; indeed, we go waaaay back, all the way back to the previous century in fact, when PA and Whatever were both starting out. Indeed, I believe I may have been one of their first advertisers, since I advertised the Web version of Agent to the Stars there, back in ’99. We’ve since occasionally done work with and for each other; Mike did the cover art for the Subterranean Press hardcover of Agent, and not too long ago I did the introduction for their book The Splendid Magic of Penny Arcade. So there’s a history there. Nevertheless, it’s super mega ultra cool to be asked to do a guest strip for PA, and I hope they liked it as much as I enjoyed writing it and working with Jeff to make it. I hope you like it too. Oh, and one other thing. Penny Arcade runs a fantastic charity called Child’s Play, which donates games and toys to children in hospitals. I’ve been a big supporter of this charity from the first year it started. As a way to saying thanks to Jerry and Mike for letting me do a guest spot, Jeff and I will be auctioning off the signed print original of today’s strip, with the proceeds to go to Child’s Play. More details on that, coming soon.